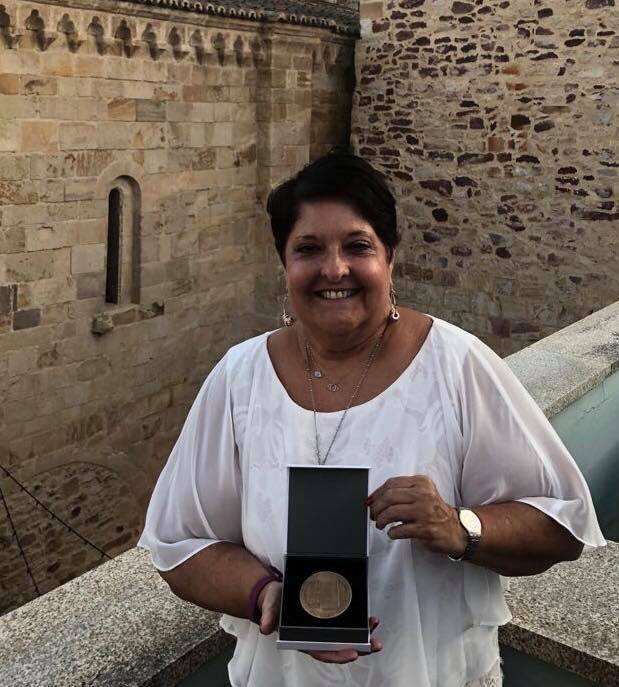 Earlier this month in Zamora, Spain, Miami resident Genie Milgrom – genealogist, author and lecturer – received The Medal of the Four Sephardic Synagogues of Jerusalem for her indefatigable labors in the promotion of the Iberian Peninsula’s Jewish legacy. Prof. Abraham Haim, president of the Council of Sephardi and Oriental Communities in Jerusalem, presented the award in the framework of the sixth International Sephardi Congress in Zamora, at which Milgrom was keynote speaker. The now-annual July congress was inaugurated in 2013 by Prof. Jesus Jambrina of Viterbo University, WI, who was honored with the medal in 2014. The award recognizes the decade-plus Milgrom spent recovering the Jewish roots of her Cuban Catholic family, and her continued efforts to assist the descendants of anusim – Jews who were forced to abandon Judaism against their will – in their search for their roots. Milgrom was able to retrace the footsteps of 22 generations in her family, back beyond 1492, to the village of Fermoselle in the hills of Zamora, and later to the cells of the Inquisition in Portugal. She recovered this genealogy using methods she describes in her book, How I Found My 15 Grandmothers, and uncovered the Jewish history not only of her own ancestral village, but also of many others along the Duero River that separates Spain from Portugal, deciphering the connections of the heretofore lost crypto-Jews of the region. Milgrom is past president of the Jewish Genealogical Society of Greater Miami, as well as the Society for Crypto Judaic Studies. Two of her books, My 15 Grandmothers and Pyre to Fire have won the Latino Author Book Awards. She has written numerous articles on the subject and lectures internationally, encouraging and assisting others to retrace their ancestors’ footsteps. As director of the Converso Genealogy Project, Milgrom now manages the momentous assignment of digitizing all the Inquisition files around the world, flying to meetings with officials in various countries to convince them of the importance of making their dusty, untouched archives available. The project has the seal of approval of the International Institute for Jewish Genealogy in Israel.